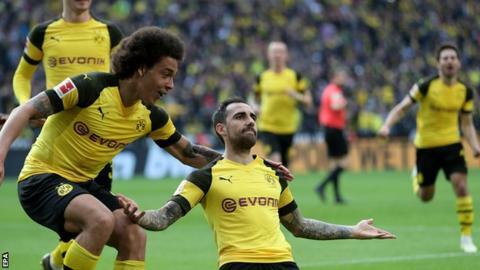 Paco Alcacer scored twice in the last five minutes as Borussia Dortmund beat Wolfsburg to go back to the top of the Bundesliga above Bayern Munich. With nine games remaining, two points separate the pair - and they face each other next week at the Allianz Arena. Alcacer scored from a free-kick in the 90th minute, before converting Jadon Sancho's ball from the right four minutes into stoppage time. Bayern dropped points at Freiburg, coming from a goal down to draw 1-1. Lucas Holer fired in for the home side after three minutes before Poland striker Robert Lewandowski equalised with a brilliant volley in the 22nd minute. It was his 199th goal in the German top flight. "It is very frustrating because we had done so well to catch up with Dortmund, and now we have to start again," said Bayern coach Niko Kovac. "I assume my players know what is at stake next weekend. We have to win now." Second Half ends, Borussia Dortmund 2, VfL Wolfsburg 0. Goal! Borussia Dortmund 2, VfL Wolfsburg 0. Paco Alcácer (Borussia Dortmund) right footed shot from the centre of the box to the bottom right corner. Assisted by Jadon Sancho following a fast break. Goal! Borussia Dortmund 1, VfL Wolfsburg 0. Paco Alcácer (Borussia Dortmund) from a free kick with a right footed shot to the centre of the goal. Paco Alcácer (Borussia Dortmund) wins a free kick in the attacking half. Attempt blocked. Jadon Sancho (Borussia Dortmund) right footed shot from outside the box is blocked. Assisted by Jacob Bruun Larsen. Substitution, VfL Wolfsburg. Daniel Ginczek replaces Admir Mehmedi. Attempt missed. Jérôme Roussillon (VfL Wolfsburg) left footed shot from the left side of the box misses to the right. Assisted by William. Corner, VfL Wolfsburg. Conceded by Dan-Axel Zagadou. Substitution, Borussia Dortmund. Jacob Bruun Larsen replaces Achraf Hakimi because of an injury. Attempt saved. Raphael Guerreiro (Borussia Dortmund) left footed shot from outside the box is saved in the top right corner. Assisted by Thomas Delaney. Offside, VfL Wolfsburg. William tries a through ball, but Wout Weghorst is caught offside. Attempt missed. Wout Weghorst (VfL Wolfsburg) header from the centre of the box is high and wide to the right. Assisted by Renato Steffen with a cross. Attempt saved. Raphael Guerreiro (Borussia Dortmund) left footed shot from outside the box is saved in the top centre of the goal. Substitution, VfL Wolfsburg. Renato Steffen replaces Felix Klaus. Raphael Guerreiro (Borussia Dortmund) wins a free kick in the attacking half. Attempt missed. Paco Alcácer (Borussia Dortmund) right footed shot from outside the box is high and wide to the right from a direct free kick. Corner, Borussia Dortmund. Conceded by Koen Casteels. Attempt saved. Jadon Sancho (Borussia Dortmund) right footed shot from the right side of the box is saved in the top right corner. Assisted by Thomas Delaney. Corner, VfL Wolfsburg. Conceded by Marius Wolf. Attempt missed. Maximilian Arnold (VfL Wolfsburg) left footed shot from outside the box misses to the right. Assisted by William. Corner, Borussia Dortmund. Conceded by William. Corner, Borussia Dortmund. Conceded by Maximilian Arnold. Attempt blocked. Achraf Hakimi (Borussia Dortmund) right footed shot from outside the box is blocked. Assisted by Paco Alcácer.